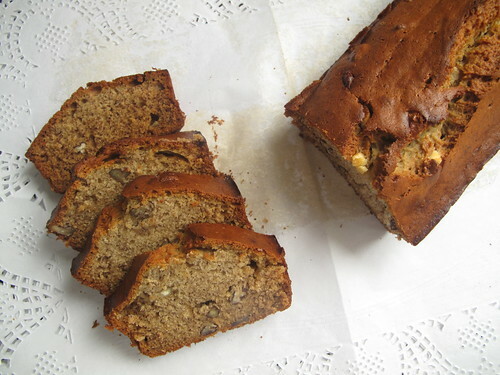 ….aka Banana bread, with white chocolate chips and pecans! It took me a while to figure out what to make for this stop of our Culinary Tour 2010, hosted by Joan of Foodalogue.. 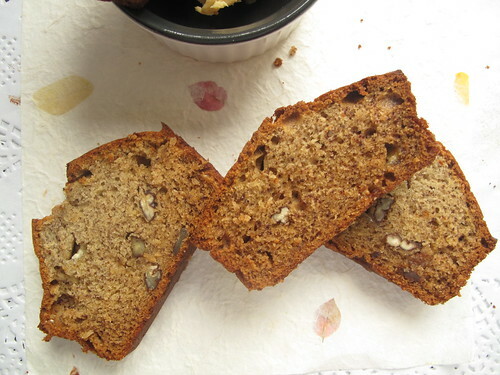 Eventually, I stumbled upon recipe after recipe for Banana bread…., and then it became very clear and apparent what exactly I had to do. Namely, make some. 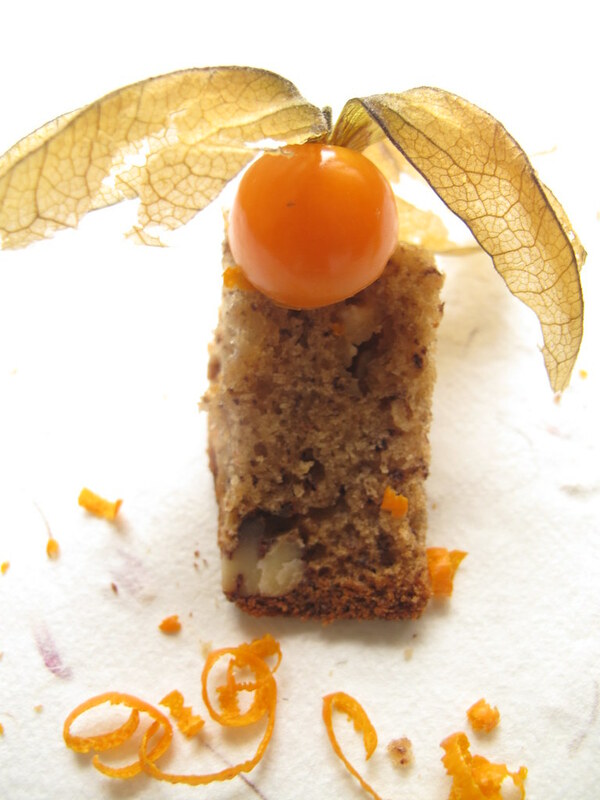 See, I have tried it once before, sort of…..
Actually, my friend, S made the bread (she is a BBE: Banana Bread Expert, churning loaf after loaf, of exportable commodity. Yes her BB has travelled from Europe to the States….., though not for me). While she worked hard, I stood by taking loads of photos and learning all her tips and tricks. 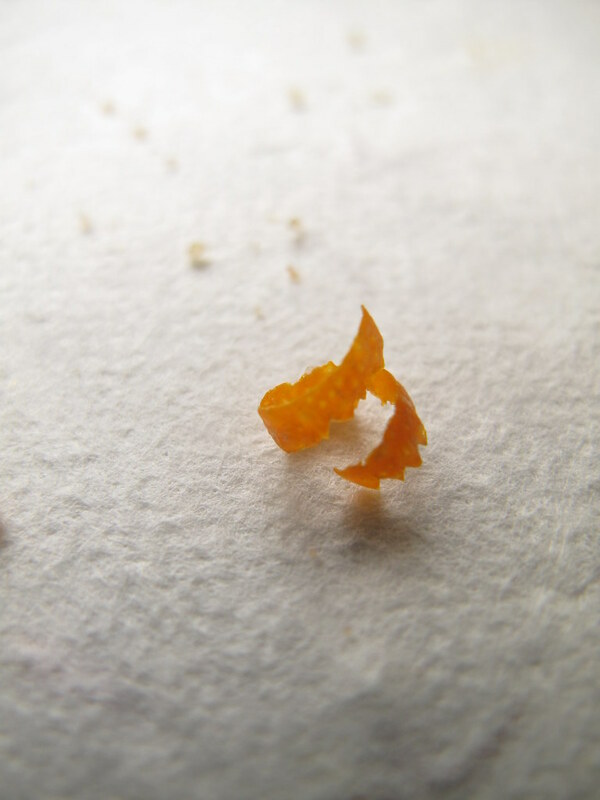 At the end of that session, I was stunned at how easy it was to make. Easy convert, I was. And still am. Forgive me for ever thinking over-ripe, unappetising-looking bananas could ever morph into glorious being! Repentant, I am. Now I know better! 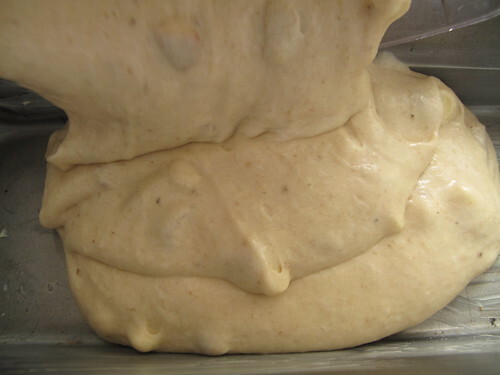 The one thing that amazed me the most about the bread when we first made it was the amazing smell, which embraced the entire house in flavours and scents so warming….. Anyhow, that didn’t at all stop the results from being fab. 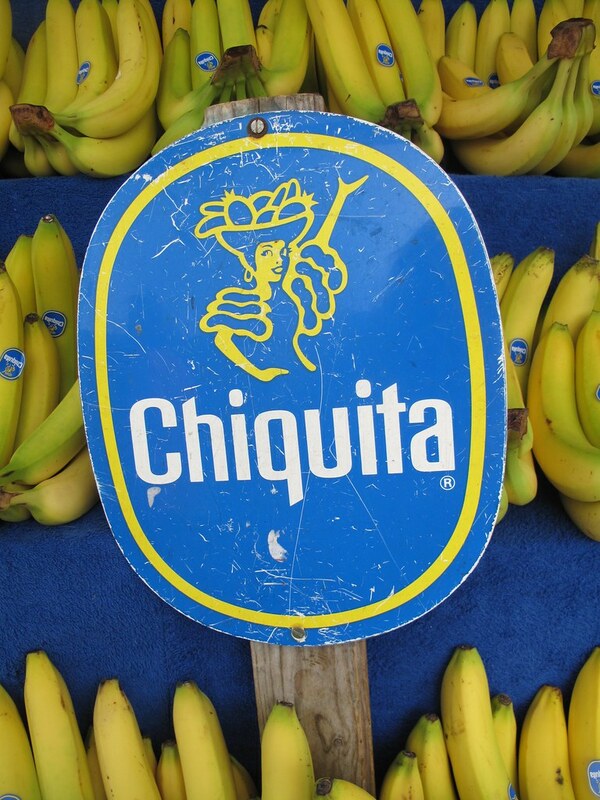 But first, a bit about Colombia and Bananas. 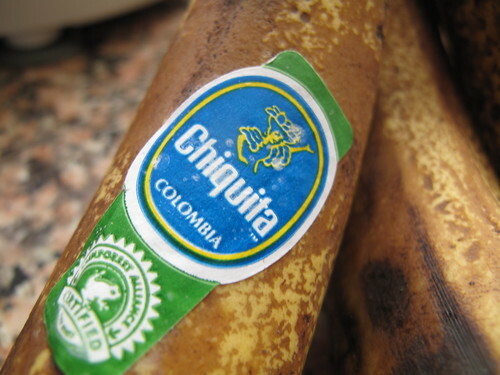 Do you know that Colombia is one of the world’s major exporters of Banana? Here’s proof, in my Dutch kitchen! Do you also find it as interesting, as I do that Bananas (and Plantains) never ripen on their trees. 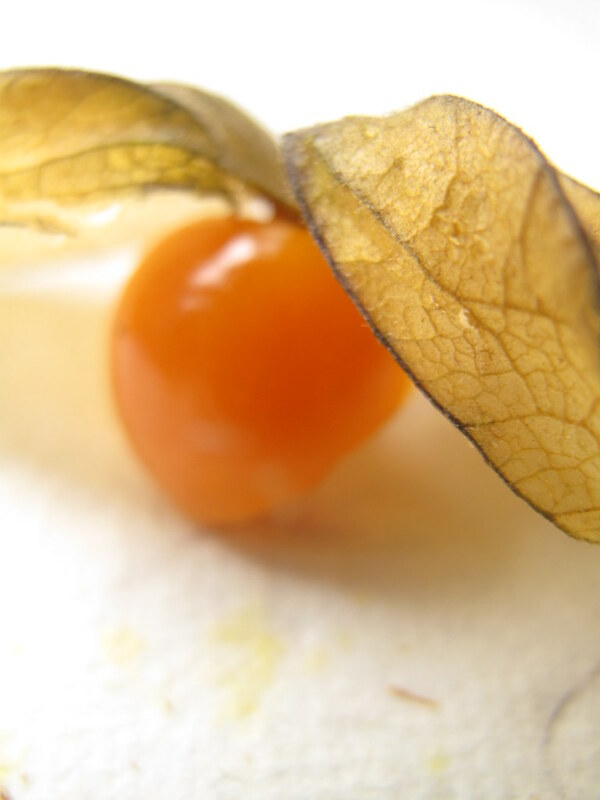 This process ONLY begins as soon as they’re cut off/harvested! 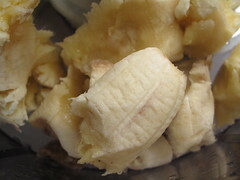 Also interesting, green bananas and plantains contain more starch than sugar, in a 20:1 ratio. However, when they start to ripen, the figures are reversed and the sugar content increases in comparison to the starch! Which is why, in Nigeria for instance, when you have high blood pressure, diabetes or and ailment which involves blood sugar regulation, green plantains are trumped as super foods! 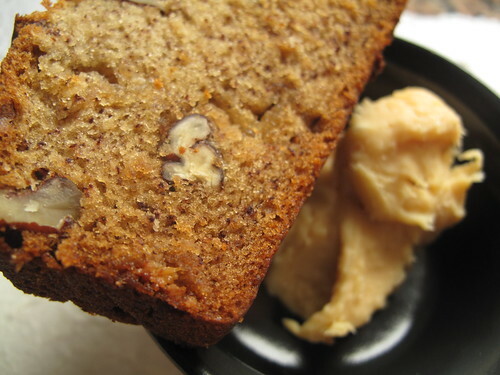 My first taste of Banana bread in Nigeria was from an aunt of mine – A Liberian. 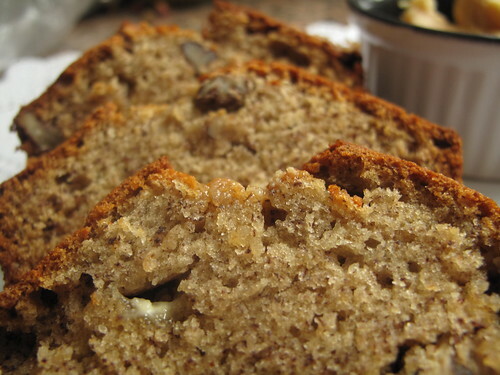 She always made Banana rice bread, which we didn’t at all find appealing. 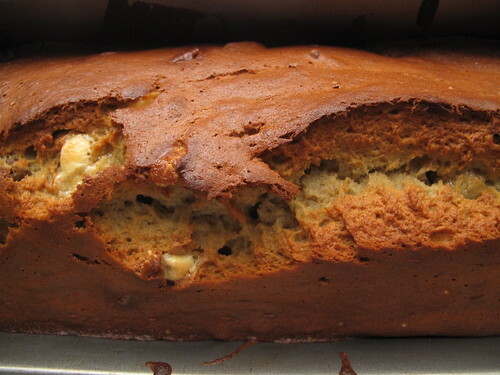 Of course, that put me off banana bread for most of my growing years. Generally, in Nigeria, we don’t bake/cook with bananas. 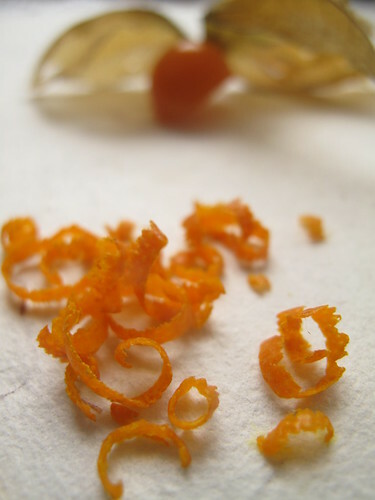 We eat them on their own mostly, have them in fruit salads or pair them with rice (instead of plantains). We also cook a lot with banana leaves, like the Asians. You’ll find rice and meats served in banana leaves – very popular in ‘street’ cuisine/hawking. 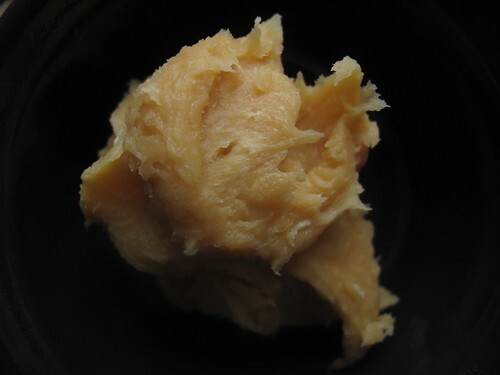 Thy are also popular vehicles for Moin-moin – a bean pudding, made from the same ingredients as Akara, but then steamed instead of fried. So yes, when I’m having rice at home, if I don’t have plantains, I’ll slice up some bananas and top with some stew (tomato sauce based) and dinner’s served. Saying that, we also have rice with chopped avocado or chopped pawpaw (papaya)! So this week, I have no serious link between Nigeria and Colombia but that’s by the way side. I personally think we don’t need to get over scientific with Pan de Banano. 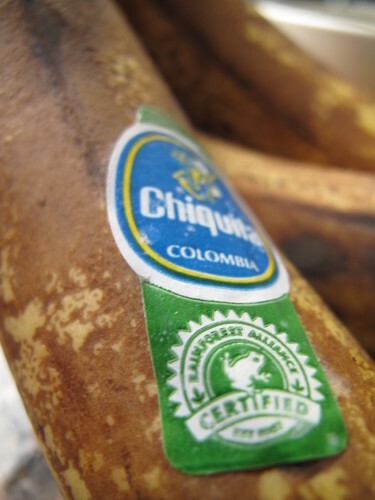 The only caveat I had at the start of my Colombian journey was that if I ever wanted my texture-crazy husband to have a taste of it, I would have to go nuts! And so I did. By adding a handful of chopped pecans. Also, I desperately wanted some chocolate in the mix (for 2 reasons – the taste…..and to send on the Meeta’s Monthly Mingle, being hosted by Jamie of Life’s a Feast! 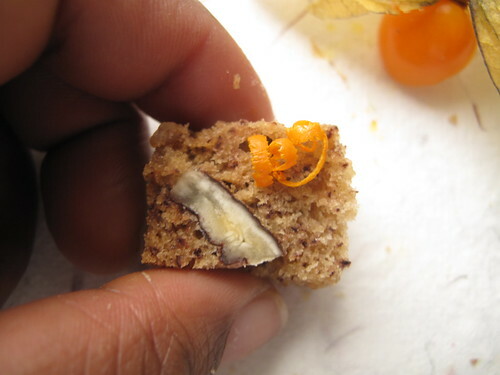 And so another handful of white chocolate chips followed……, was nice but….not really necessary. What would have been awesome, on reflection is dark chocolate. Like what Kate sent. BTW, I’m also sending this on to Yeastspotting – a weekly showcase of bready goods! 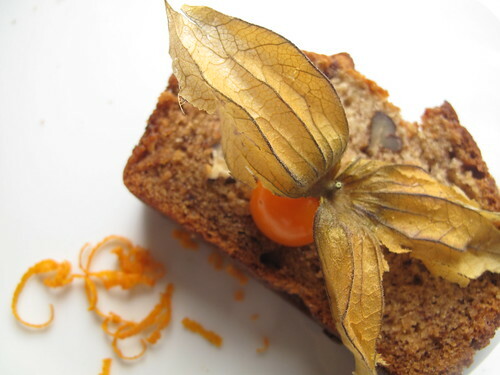 And saying that…..I still have some left, and one over-ripe banana lying around….a re-match is a must! 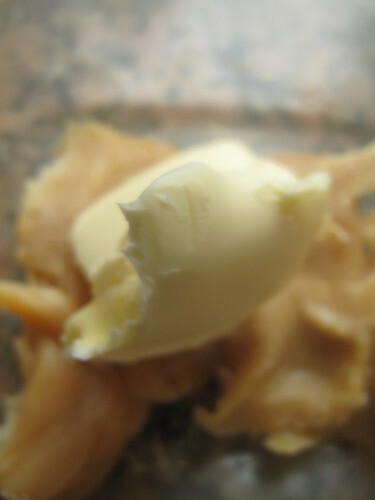 Melt the butter then measure out the quantity you need. Might be easier than stuffing your measuring cup full…..
S insists that using a metal blade/metal utensils when processing the bananas affects the texture. 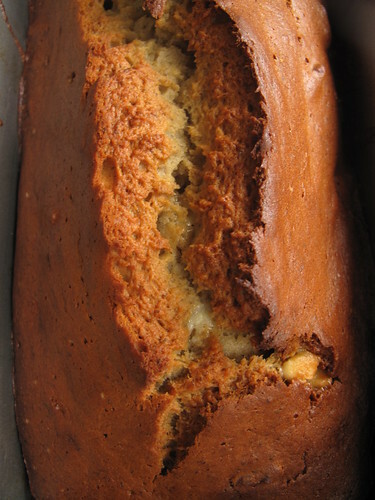 I used my metal blade and it didn’t seem to affect the texture at all…it seemed finer in crumb than the previous and of course didn’t have the required super smells but…it tasted pretty good! 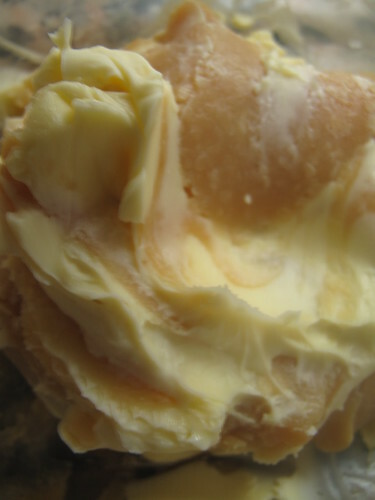 Grease a 4×8 inch loaf tin/pan with butter or baking spray and preheat the oven to 350 degrees Farenheit (about 180 degrees Centigrade) . 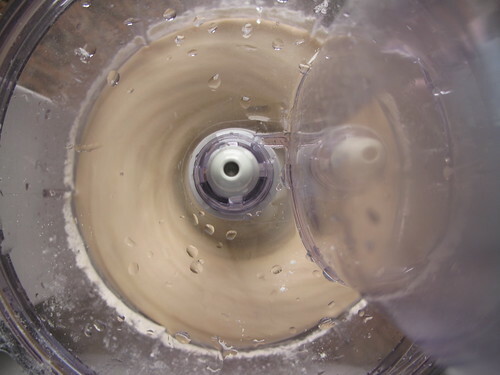 In your food processor or in a large mixing bowl with a wooden spoon, mash up the bananas (in the food processor it took about 15-20 seconds, it is bound to take longer by hand). Essentially, in the food processor, they ended up liquified! A suprise to me the first time around! Add the melted butter to the mashed bananas. 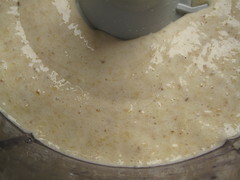 Mix/whizz in the sugar, egg, and vanilla. 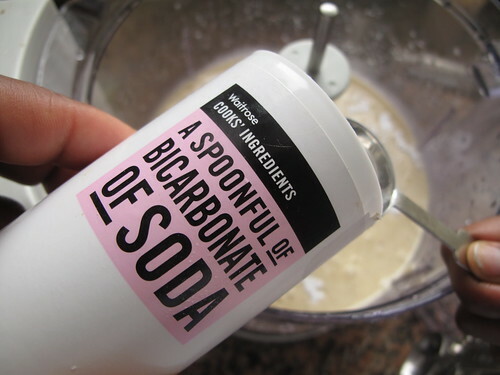 Sprinkle the baking soda and salt over the mixture and mix/whizz in. Add it now and then mix well. 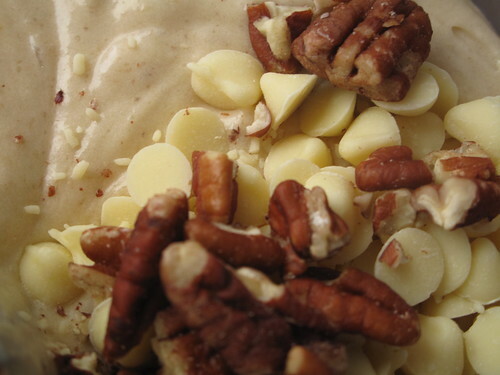 Add your chopped pecans and chocolate. And then pour the mixture into your greased pan. 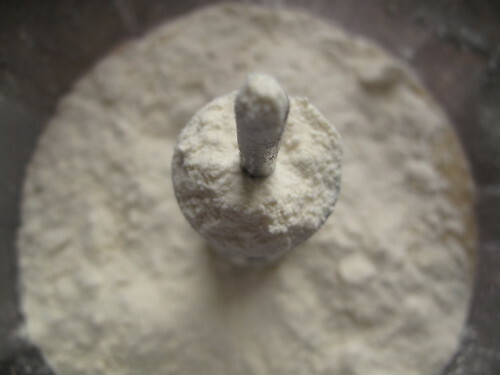 Baking time is about 45 minutes. 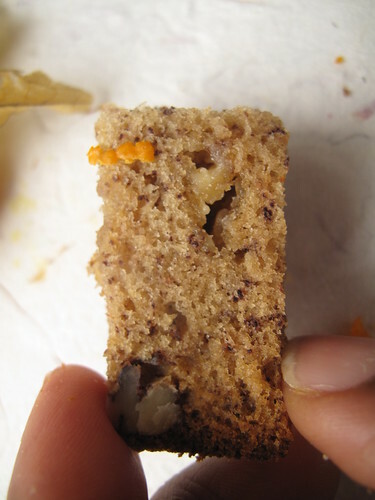 Test for doneness by inserting a toothpick or cake tester into the centre of the loaf. It should come out clean or with a few crumbs, not clumps. Remove the pan from the oven and set it on a rack to cool for about 10 minutes. Then tip it out of the pan onto a plate and let it cool down further. I was/am ecstatic. Overjoyed. I’ve done it. Finally. 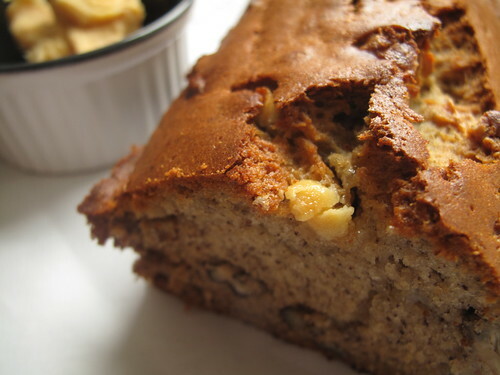 Made in my kitchen, the first ever Banana bread….of my life! 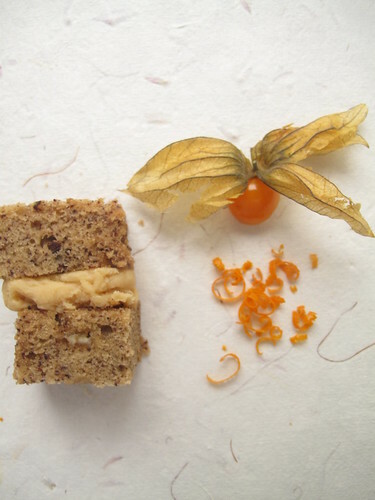 And the verdict – soft, smooth….great banana flavour. A bit sweet though. 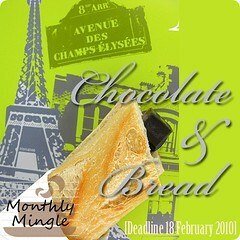 again dark chocolate! The nuts tempered the smoothness of the bread. 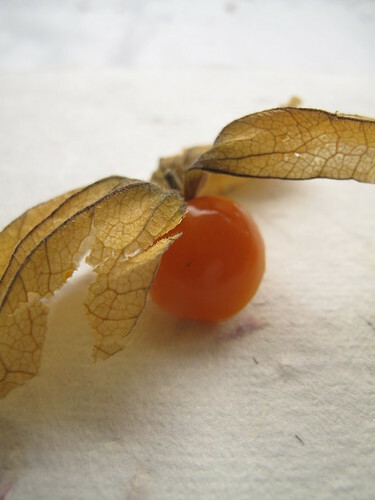 According to hubby: ‘Not bland and boring!’ What more can I say, except that…inspired by a photo in a book – Live Challenge 1999 (Too many cooks) , I started playing about with orange zest and some cape gooseberries (physalis). 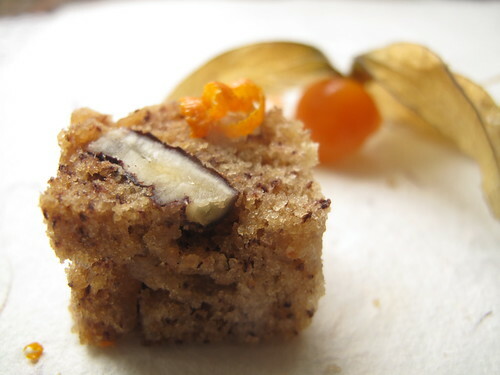 I cut the banana bread into petit four size and sprinkled some zest atop. And then I took a bite……and I was transported to a super fragrant land……far, far away. 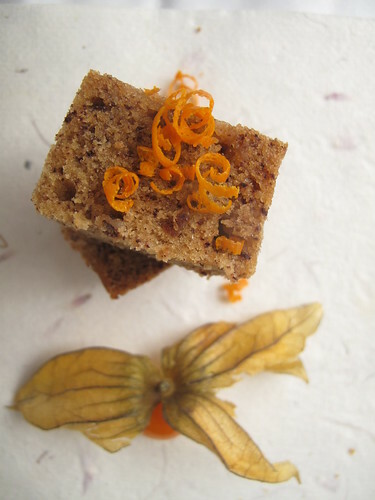 Where citrus meets sweet, meets meaty, meets dessert, in a wonderful mélange of exciting flavours. Never again will I make Banana bread without some orange in it. And I mean…NEVER. 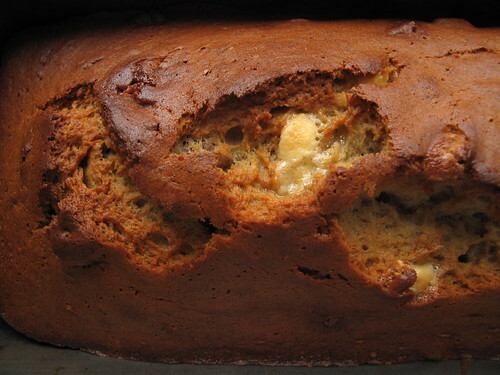 Can you see it – the melted chocolate studding smooth, rich banana bread…..
Now taste it……take a bite. Tell me what you think. Is this for sure, not the future of great Pan de Banano y Naranja? I think it is……and as soon as this dream transitions to reality….you’ll be the first to know. 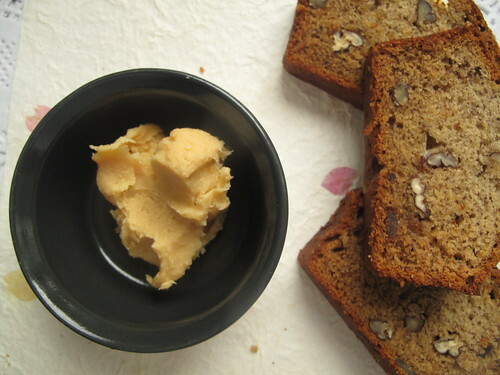 I’ve been so taken up with my BB, that I almost forgot to mention the DDL butter…. 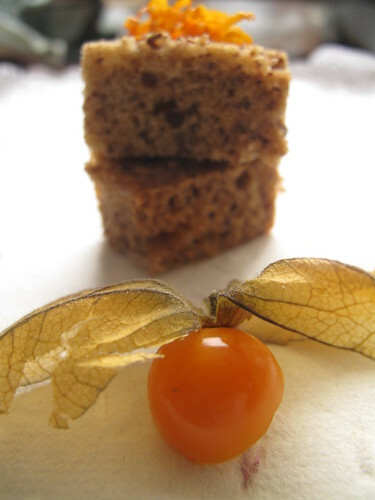 To be perfectly honest, it was again….a bit superfluous….like the white chocolate. But pretty nevertheless and perhaps a better option for pancakes or waffles instead! Next week, we’re in Jamaica. Please join me for some Jerk Fish, Rice and peas in slashed peppers….and Creole sauce. I missed the first stop Mexico and I’ve now decided, that for my peace of mind and health, I will make some Mexican hot chocolate, because I have a molinillo and some Mexican chocolate at home….. But that’s an internal Oz resolution. Pay me no heed. 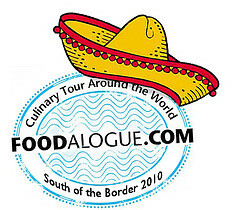 See you next week on Culinary Tour, 2010!